Did the 1953 London Debt Agreement (LDA) contribute to West Germany’s subsequent growth? If so, how? There are many competing explanations for why West Germany fared so well (Eichengreen and Ritschl 2009). One is that it simply returned to its long-term growth path after the war. However, this post-war reconstruction hypothesis cannot account for German performance compared to other equally devastated western European nations. Other policy and institutional factors must have played a role. A second explanation is that growth arose from new trade partnerships formed in the late 1940s and 1950s. Yet, according to the Penn World Tables (2015), during the 1950s the degree of openness of the economy – reflected by the sum of exports and imports as a share of GDP – was actually lower in Germany (24.5%) than in the UK (43.2%), Austria (38.5%) and France (26.7%). Although the impact of the debt relief on Germany’s economy is still debated, Reinhart and Trebesch (2016) have recently examined the aftermath of debt relief in 45 countries between 1920-1939 and 1978-2010 and find that the economic situation of debtor countries improves significantly after debt relief, but only if the relief includes debt write-offs. They calculated that, on average, write-offs of 40-50% during the interwar period led to increases in GDP of 20-30% in the five years after the debt cancellation. Reinhart and Trebesch (2016) look at the impact of debt restructuring during the interwar period and in recent decades, but they do not look at what happened after WWII, so their work does not include the LDA. Our recent work has shown three ways in which debt relief in Germany mattered (Galofré-Vilà et al. 2016). What did the London Debt Agreement include? For West Germany, the main economic elements of reconstruction were the Marshall Plan plus three structural reforms (Ritschl 2012). The first two were the currency reform of 1948 and the European Payments Union (1950-1958). After they had been adopted, the third critical element, the LDA, was introduced in 1953. The LDA was undertaken once the Allied forces were satisfied that these prerequisites were fulfilled. Although the Marshall Plan mobilised large sums of financial aid ($13 billion or 2% of the US GDP), the financial aid for Germany was relatively small ($1.4 billion) compared with sums provided to the UK and France (Eichengreen 2011). Reduction of pre-war and post-war debts: Germany owed DM29.7 billion, which was reduced to DM14.5 billion (Deutsche Bundesbank 1959). In nominal terms this was equivalent to 22% of German GDP in 1952 (Sinn 2012). Repayment of the remaining debt was linked to Germany’s economic growth and exports: The debt service/export revenue ratio could not exceed 3%. Creditor countries to renegotiate the terms of repayment: This could occur if circumstances made debt service more onerous than originally thought. This was not necessary given Germany’s financial and economic performance in the 1950s and 1960s. To explore the aftermath of this debt relief, we used new data compiled from the monthly reports of the Deutsche Bundesbank (the Central Bank of the Federal Republic of Germany) from 1948 to the 1960s. These reports provide detailed statistics of German finances and a narrative of the evolution of the German economy on a monthly basis. One of the principal intended economic benefits of the LDA was that it would free fiscal space. This space could then be used for domestic investment and to satisfy pent-up demand for social expenditure. If this was true, then after the LDA social expenditure should have grown relatively quickly compared to other categories of expenditures. To explore the extent to which the LDA was associated with a rise in real per capita social expenditure, we ran difference-in-difference regression models that explained changes over time in 14 different types of real expenditure per capita. 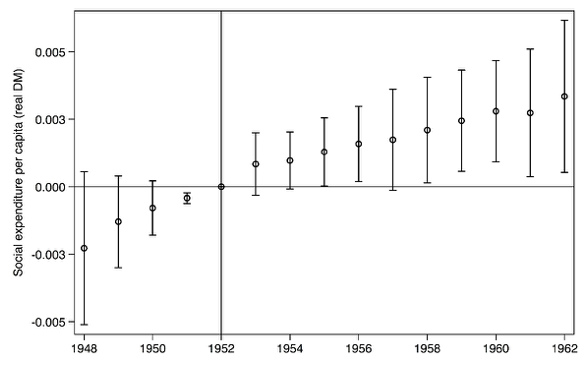 Our sample spanned 1948 to 1962, including both pre- and post-LDA years. The treatment group was social expenditure, which groups the spending categories of health, education, economic development, and housing. The control group contained the remaining 10 categories. We find that the LDA was associated with a substantial rise in real per capita social expenditure in health, education, housing, and economic development, this rise being significantly higher than changes in other types of spending that include military expenditure, and higher than in pre-LDA years.1 We also estimated a 'fully flexible' difference-in-difference model allowing for separate coefficients on the social spending category in each year of the sample. This model also included year dummies and fixed effects for the 14 expenditure categories (Figure 1). Overall our results are consistent with observations by the Deutsche Bundesbank (1963) that debt repayment under the LDA determined to a large extent the course of public investment and expenditure, and as debts were repaid (or cancelled) this freed up new resources for public investment. Notes: Coefficients are estimated by OLS. Regression includes fixed effects for each spending category and year indicators. Social expenditure includes four categories of spending: economic development, health, education and housing. 95% confidence bands based on robust standard errors. Since the LDA removed the likelihood of a new default, foreign investors regained confidence in West German finances and the LDA coincided with new foreign borrowing and investment. This in turn helped promote economic growth. Benchmark yields on long-term debt, an indication of default risk, dropped substantially in West Germany when LDA negotiations began in 1951 (from 3.3% to 1.83%) and then stabilised at historically low rates after the LDA was ratified (at 2-3%). Ironically, the LDA also led to new German indebtedness. As discussed by the Bundesbank (1964), DM15 billion of new indebtedness between 1953 and 1962 was due to the fast-growing German economy, and the increasing appetite of foreign investors for German securities. Stabilising inflation was the final major economic benefit. In 1948 West Germany introduced the deutschemark (DM). It was highly volatile until 1953, after which time it largely stabilised due to the improved situation of German finances. This was also because Germany had moved from being a large net debtor at the end of the war to a creditor by the middle of the 1950s. Notes: Data from bond yields are from the Global Financial Data (https://www.globalfinancialdata.com/index.html) using data from the Deutsche Bundesbank for Germany and from the Federal Reserve Bank for the USA. Data from CPI are from Piketty and Zucman (2014). The debt restructuring under the LDA proved to be a success. While there had been a problem of debt prior to 1953, a decade later there was none. The LDA may have implications for contemporary management of debt in southern European countries. There are, however, political-economy differences between then and now (Guinnane 2015). The German economy was already growing between 1950 and 1952 at a remarkable rate of 8% per annum. We cannot know whether the conditions for restructuring debts would have been the same without initial signs of recovery from Germany. Indeed, since debt restructuring was tied to the Marshall Plan and formed part of a broad range of measures for European recovery, we must view the success of the LDA in the context of the currency reform of 1948 and the creation of the European Payments Union (Ritschl 2012). Also Germany represented 15.4% of the western European population in 1953, compared with 2.1% for indebted nations such as Greece today. Finally, Germany was an important ally in the Cold War and the US-led fight against the expansion of the Soviet Union. In assessing the LDA, we must disentangle political motivations (in particular foreign policy) from economic goals. Even if we were to ascribe the most cynical and instrumental motivations to the LDA of 1953 (the need for a strong Germany in the context of the Cold War of the 1950s, in addition to the realisation of the errors of the Versailles Peace Conference and their subsequent effects), it is clear that this debt relief was emphatically designed to help Germany grow. It always prioritised German economic health over the repayment of debt. This is a striking contrast with recent and current policies toward southern Eurozone countries. Ironically, Germany was the biggest European debt transgressor of the 20th century, as pointed out by both Thomas Piketty and Albrecht Ritschl (Harlan 2015, Ritschl 2011). Germany strongly insists that Greece, Portugal or Spain pay their obligations, forgetting that Europe was built in part on absolution of debts so that new generations did not pay for the mistakes in the past. Revisiting the LDA we can see how different the policies in the Eurozone crisis have been, and also how these policies may help explain the length of the associated recessions. Der Spiegel (2011), “Economic Historian: ‘Germany was biggest debt Transgressor of 20th century.’” Spiegel Online, June 21. Deutsche Bundesbank (1959), "German external debts under the London Agreements, May 1959." Monthly Report of the Deutsche Bundesbank. —— (1963), "Monthly report of the Deutsche Bundesbank, January 1963." Monthly Report of the Deutsche Bundesbank. —— (1964), "German external indebtedness, March 1964." Monthly Report of the Deutsche Bundesbank. Eichengreen, B (2011), "Lessons from the Marshall Plan." World Development Report background papers 62,042. Eichengreen, B and A Ritschl (2009), "Understanding West German economic growth in the 1950s." Cliometrica 3:191-219. Galofré-Vilà, G, M McKee, C M Meissner and D Stuckler (2016), “The Economic Consequences of the 1953 London Debt Agreement” NBER working paper 22557. Guinnanne, T (2015), “A Pragmatic Approach to External Debt: The Write-down of Germany’s Debts in 1953.” VoxEU.org. August 13. Harlan, C (2015), “Thomas Piketty Accuses Germany of Forgetting History as It Lectures Greece.” Washington Post, July 6. Reinhart, C M and C Trebesch (2016), “Sovereign debt relief and its aftermath.” Journal of the European Economic Association, 14(1), pp. 215-251. Ritschl, A (2012), “Germany, Greece and the Marshall Plan.” The Economist, June. Sinn, H-W (2012), “Germany, Greece and the Marshall Plan, a Final Riposte.” The Economist, June. Weitzel, O 1(967), “Die Entwicklung der Staatsausgaben in Deutschalnd. Eine Analyse der öffentlichen Aktivität in ihrer Abhängigkeit vom wirtschaftlichen Wachstum.” Dataset from the Friedrich-Alexander-Universität Erlangen-Nürnberg. Details on the regression analysis available in our NBER paper.